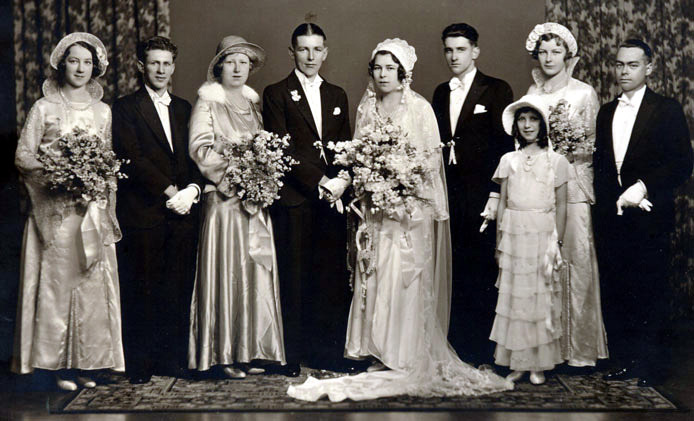 Photo from the 19 September 1931 wedding of Clara (Clare) Grace Smiley and James McKnight (Mac) Moore. From left: Mollie Bunn, Jack Nixon, Jean Nixon, James (Mac) Moore, Clara (Clare) Smiley, Hector Crawford, Peg Moore, Bertha Smiley, and _______________. Return to website information about Clara (Clare) Smiley.